White Girls ends with the essay “It Will Soon Be Here,” a meditative consideration of memory and the flexibility of first person. The essay could prefigure the entire collection by Hilton Als: “For as long as my memory can remember, I existed characterless, within no memory at all. Or if I did exist it was in remembering the text of someone else’s life—that is in the devouring of biography.” That which is devoured must soon be released, and Als does so in White Girls, covering Truman Capote, Eminem, Richard Pryor, Malcolm X, André Leon Talley, James Baldwin, Flannery O’Connor, and Als himself. Early critical mentions of this book as controversial not only miss the point (idiom Als uses effectively on many occasions regarding the misunderstanding of other persons and writers), but fail to recognize that Als has been building toward this book since The Women (1998). 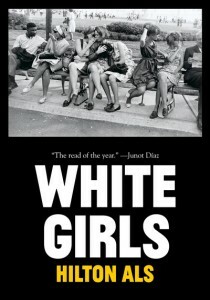 White Girls is pure performance, a writer in absolute control. In “A Pryor Love,” Als’s wide-ranging essay on the comedian, he notes that “unlike Lenny Bruce, [Pryor] didn’t believe that if you said a word over and over again it would lose its meaning.” The same could be said of “white girls,” or “white women,” which are flashed by Als like a card, a refrain, a reminder. In a scene within “The Only One,” Als’s sketch of Vogue editor Talley, a “black drag queen . . . sat on the lap of a bespectacled older white man,” and said “That’s what I want you to make me feel like, baby, a white woman.” For Als, being or becoming white is not quite an assimilation into difference, it is an act of twinning. White Girls begins with the nearly 100 page nonfiction novella, “Tristes Tropiques,” that documents Als’s complicated love for SL (“Sir or Lady”), who is first described in the midst of a daydream. It would be quite dangerous to read White Girls in full-on mimetic mode; the book starts, after all, with Als imagining SL “deep in movie love,” thinking about SL’s own thoughts, when the “movie guy kisses the movie girl and they are one.” This trope of twinning becomes an anchor for not only the relationship between Als and SL, but also the other loves of Als. Also loves SL, but they “are not lovers. It’s almost as if I dreamed him—my lovely twin, the same me, only different.” There are levels and modes of twins. Als recognizes the idea of a mirror, that other that is the self, but also the opportunity to “grow into one . . . as Aristophanes sort of has it in The Symposium.” Twinship, for both SL and Als, is the “archetype for closeness . . . [and for] difference.” Twinship is “marriage . . . joined by a ring and flesh.” It is “reflection.” The origin of this desire? “I have always been one half of a whole,” Als admits. An older brother was stillborn; “my ghostly twin, my nearly perfect other half.” His mother is his “soul’s twin.” For Als, all love is a form of self-completion, the discovery that the “I” needs a second to live. It’s partially true: Nick Ripatrazone’s new novella begins with Luke camped out in the woods, hunted by a pack of wolves. He has to let his horse free so the wolves will follow it instead of him. When he gets home, tragedy has occurred. He traipses through wailing snow to find the man that raped his daughter, shotgun in hand. 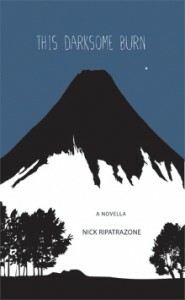 Even the cover of the book is a great volcano-like mountain, rising foreboding and dark against the night sky. The wilderness is This Darksome Burn’s setting, as billed. But the really valuable work of the novella is in the juxtaposition between Luke’s “toughness and tenacity” and something less wild: not “his own bereft emotional frontier,” exactly, but the demands of a modern world on a man who has most of his life relied on reticence and grit, virtues of a time that has gone. Mixed martial arts matches often descend into tussles, yet boxing remains a splintered dance: when you are down, you are out. The stripped-down bodies of boxers moving on the lit ring-stage is ripe for literary fetish; even Joyce Carol Oates, whose God is the unsentimental moment, could not resist waxing about Mike Tyson. Although Leonard Gardner’s 1969 novel, Fat City, chronicles the emotional and physical destruction of impoverished fighters in Stockton, California, he could not resist corporeal iconography: “Padded and trussed, his face smeared with Vaseline, a rubber mouthpiece between his teeth, he stood waiting while two squat men punched and grappled in the ring.” Sinewy syntax to represent a body ready to burst. The same mythos allows Adrian Matejka to channel Jack Johnson, the first black heavyweight champion. Matejka concedes that Johnson, in his own memoirs, was a “natural fabulist,” so fact matters less than emotion. But hasn’t it always in boxing? When Frank Bruno said he would knock Tyson onto Don King’s lap, no one believed him: except himself. The inches between boxers allow for miles of fantasy. The same tendency toward fantasy makes many persona poems feel like projections of the poet rather than reconsiderations of the subject. Thankfully, Matejka resists pure fantasy and artifice; treatment of Jack Johnson is complicated and passionate. He appreciates his subject, much better than the analytical mode of much persona poetry, which makes the phantasmagoric act an exercise rather than an experience. From the start, his focus is on Johnson’s body: the tension between whether Johnson owns his own body enough to profit from it. It’s a smart take on the slavery that Johnson’s parents endured, and that he retains, in and out of the ring. 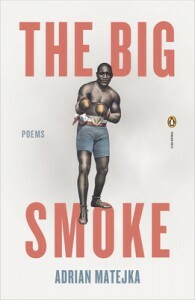 In “Battle Royal,” the collection’s first poem, Johnson and other blacks fight for a single prize: “the last darky on his feet gets a meal.” Free enough to know what whites feared him, and to use that fright to complement his athleticism in the ring, but enslaved by a new system, where money creates identity, however tenuous. 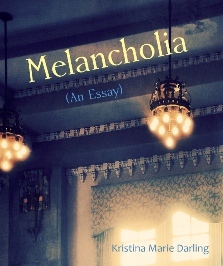 Parenthetically titled “An Essay,” Kristina Marie Darling’s Melancholia is a collection of prose poems, independent lines, notes, and fragments. Prose poetry and essays are not imperfect bedfellows. Samuel Johnson defined the essay form as “A loose sally of the mind: an irregular indigested piece; not a regular and orderly composition.” His definition sounds appropriate to the form’s modern originator, 16th century French writer Michel de Montaigne, whose works unfold as scattered meditations on words and concepts. Yet Johnson’s definition is also curiously apt as a description of contemporary prose poetry. 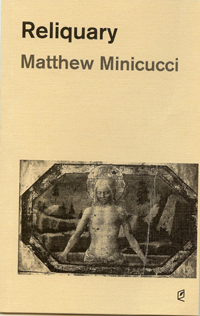 Often lacking a central narrative, prose poems typically contain development of breadth rather than depth. Darling solves that problem by using the prose poem form to link imagistic snapshots that accumulate the work’s emotional content. Yet Melancholia is difficult to classify. Its structural form is prose poetry, its conceptual mode is almost filmic, and its narrative mode owes much to the essay’s tendency to classify and define. Melancholia posits that a poet-narrator is a good choice to “select and omit”: Darling’s prose poems are more concerned with absence than presence, as white space outweighs text within the book. Such ratio is not shocking in a volume of poetry, but the prose poetic form reestablishes the physical page in poetry. When a poet reaches for the margins in her sentences, her later abbreviations become more obvious. Darling has a nice sense of the physical page, and Ravenna Press’s pocket series, at roughly 6 by 5 inches, is the right size for a typographically spare collection. Darling’s complicated form mirrors her complicated content. Melancholia documents a fragmented relationship in a previous, possibly Victorian, era. Time is ambiguous in the collection: although the overarching narrative occurs in an epoch of cufflinks and corsages, the work references a “little-known French film, in which the heroine makes her living by keeping nightingales,” and another, equally obscure film, where “a woman refers to her beloved as a ‘strange machine.’” This confusion about time arises from the poet’s role as essayist. Darling’s core narrative is centered on a feuding, and later separated, couple, but she overlays that narrative with fragments of fact. Her reason for bending form is tied to her title: melancholy lacks the sharp edges of anger and sadness. It is a paradoxical feeling of heft and weightlessness, so a poet would be smart to mix poetry and fact as she struggles to understand pain.